Staff and volunteers at the State Herbarium of South Australia and botanists and conservationists in the Mount Lofty Ranges have been saddened by the news of the passing of Enid L. Robertson, botanist and conservationist. Born in 1925, Enid celebrated her 90th birthday late last year. She was born into the Ashby family and following Grandfather Edwin, who established Wittunga Botanic Garden in 1902, and father Keith, inherited the family interest in native plants. Her Aunt Alison was an artist who rendered hundreds of watercolour paintings accurately, invariably vouchered by herbarium specimens. Following studies for her B.Sc. at The University of Adelaide (1944-1946), where she was awarded the John Bagot Scholarship in 1944 for her results in Botany 1. Enid was appointed in 1947 as a systematic botanist at the Waite Institute, South Australia. Subsequently with the awarding of a Senior Research Fellowship by the University of Adelaide from 1953‒55, she completed the revision of the fourth volume of the second edition of J.M. 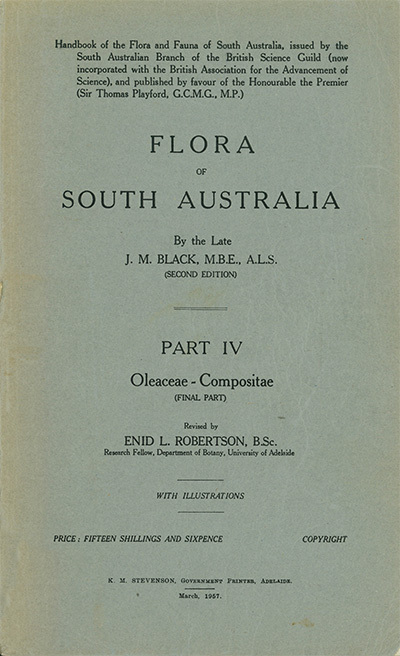 Black’s, Flora of South Australia following Black’s death in 1951. In 1967, she took up a key position supporting Bryan Womersley’s world-leading phycological studies at the Botany Department, The University of Adelaide. She managed the research infrastructure which included a major herbarium and an algal culture facility. 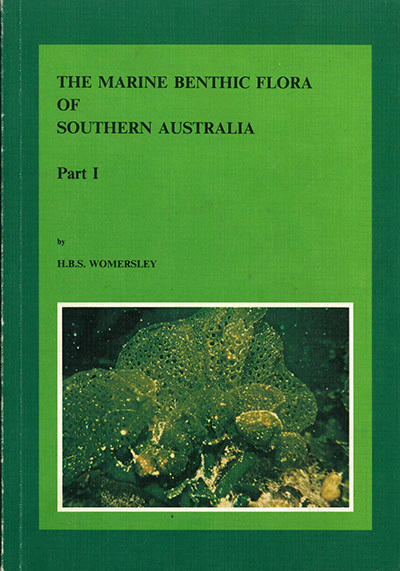 During this time, she focussed on seagrasses, writing them up as a Chapter in Womersley’s exemplar, The Marine benthic flora of southern Australia. On retirement in 1987, Enid spent her many remaining years passionately focussed on conservation in the Mount Lofty Ranges, both in the protection of the native flora and also in the identification and eradication of the ever-growing number of invasive plants. Such was her presence and passion that she was singular in her ability to stimulate conservation groups in these pursuits and in recruiting many helpers from the general community, particularly in the eradication of weeds. She took great care in verifying the identity of plants, and with new weeds, often collected vouchers with the note that she had eradicated the plants she had come across. In all, she lodged about 1,250 specimens in the State Herbarium. 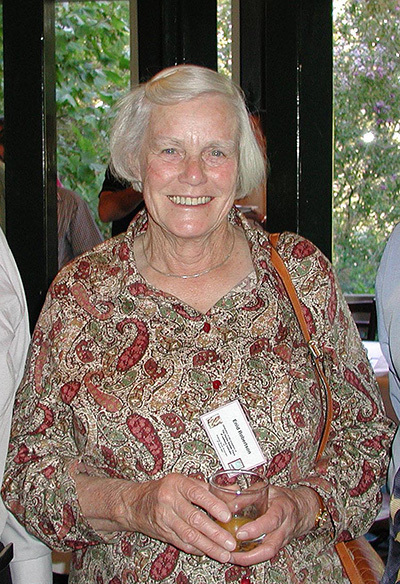 Enid was made a Member of the Order of Australia (AM) in 1997 for services to botany and to the community, particularly the conservation and management of native vegetation in South Australia. She and her Aunt Alison before her, were both honoured with Australian Natural History Medallion for Botany in 1992 and 1975, respectively. Enid will be remembered as a capable, passionate botanist who made significant contributions to her field. She was a person of integrity who took a genuine interest in others. Her care and support were appreciated by many staff and students of the Botany Department, The University of Adelaide, and the State Herbarium. Contributed by State Herbarium Manager Peter Canty. This entry was posted in News on 5 August, 2016 by Jürgen.